Security labels - buy now..
New, improved Voidtec is a self adhesive tamper evident security seal or security label which is self voiding. 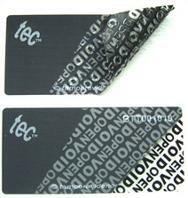 Produced from polyester tape with a high tack adhesive it is is available in two sizes, in high contrast black with non residue and total transfer versions. Supplied in rolls of either 500 or 1,000 seals, pre printed with sequential numbers and is normally available for dispatch within 2-3 days.